The Navajo Nation is the largest Native American "Reservation" in the United States covering over 27,425 square miles. Significant sections of Northern Arizona and New Mexico and southern Utah make up the Navajo land. In 1868, after five cruel years of imprisonment at Bosque Redondo, the Navajo endured the Long Walk home. 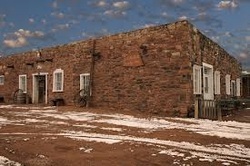 Trading posts were set up on the Navajo land, and trade became very important to the impoverished Navajo who were rebuilding their lives again. Each post had a name, and, more importantly, a trader, who often wore many hats - for example, that of doctor, translator, lawyer, and businessman. These traders had a great responsibility in acting as a middle man between the Navajo people and the "outside" world. Being a trader was often a very solitary lifestyle, but they sometimes married Navajo women, had children, and lived more intimately within the Navajo culture. Where Navajo weavings made for trade were concerned, the trader exerted some influence on the weaver's choice of color and pattern, to better suit the aesthetic needs of the tourist or collector. 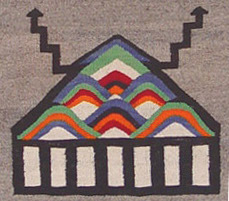 Over time, blankets and rugs from the same region developed a general look, and became identified with the region or by the trading post from whence they came. 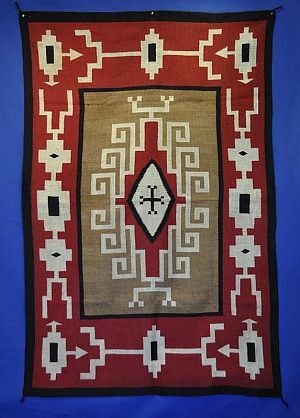 Consequently, a red field rug with heavy cross or central lozenge motifs is often regarded as a "Ganado," for this style of color and pattern was a favorite of the famous trader, Lorenzo Hubbell of the Ganado, Arizona trading post.